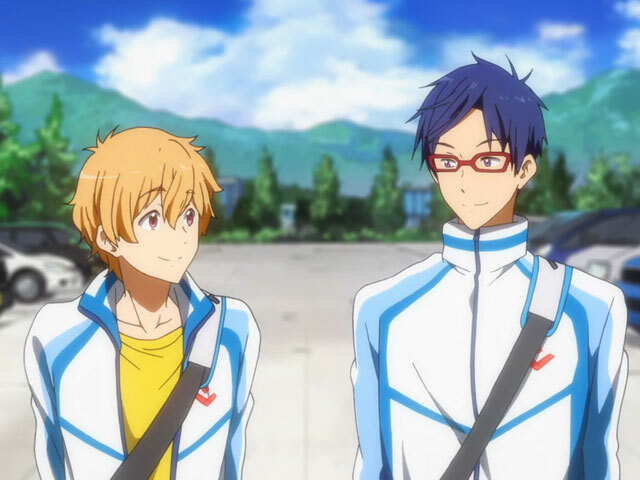 Rei Ryugazaki and Nagisa Hazuki are from the anime Free! where they were teammates on their school's swim team. They first met early in the first season when Nagisa was unsuccessfully trying to recruit a much needed fourth member for the swim club. He found himself captivated by Rei, who was insistent in his disinterest in swimming, and made it his personal mission to convince him to join, especially when he realized that Rei would complete the team of boys with girl names. Due to Nagisa's persistence and being moved when he watched Haru swim, Rei agreed to join the swim club (although he probably decided the moment Nagisa told Rei he was beautiful). The only problem, however, was that Rei not only couldn't swim, but that he would literally sink to the bottom of the pool whenever he tried. It was really sweet to watch Nagisa help Rei learn to swim with his cheerful optimism, and see Rei, who always had things come easy to him once applied himself, really struggle to succeed in the club, not only for himself, but for Nagisa and his other teammates who truly believed in him. Rei and Nagisa's friendship seemed so natural and they quickly and easily became best friends, partners-in-crime, and each other's biggest cheerleader. Whether it was spying on Haru and Rin at the festival, each individually fretting that the other was going to quit the club, or casually mentioning how they hung out together off screen, they were always cute to watch. Rei, although logical and intelligent, tended to over think and could be quite dramatic, while Nagisa, who was almost always cheerful and laid back, could sometimes push things to the side instead of dealing with them head on. Together they really balanced each other out and found that they could rely on one another. It was also good that with the third years graduating that they would still have each other in the swim club for their last year of high school. It was all because of Nagisa that the Iwatobi Swim Club formed and got off the ground, and not only was that the start of the club but also of a beautiful friendship between Rei and Nagisa. I really like the two of them together and their scenes were so refreshing in an anime where there could be so much emotional drama and miscommunication between the characters. Rei and Nagisa were on the same wavelength and at the same place in their lives, and in the fandom it is also nice to not have any shipping drama or love triangles with these two characters. Their duet CD was also one of the cutest things ever, where the drama track (although in Japanese) covered Nagisa and Rei doing karaoke together, before Nagisa fell asleep on Rei while Rei clicked through the whole catalogue of available songs for them to sing. These two boys just make me happy and I look forward to seeing where their journey takes them in the future. Rei: "Why does it have to be me?" Nagisa: "Because you're a boy with a girly name?" Nagisa: "Yeah. But the main reason is because you looked beautiful." Nagisa: "When you were pole vaulting. Your jump looked really beautiful, Rei-chan!" Rei: "You were the one who initially invited me to join. I expect you to take responsibility, Nagisa-kun." Nagisa: [beaming] "Sure! You can count on me! " 1x08: Revenge in the Medley! Gou: "Man, what were you guys doing? You're late!" Rei: "We were practicing the exchange in the pool at school." Nagisa: "That eliminates the possibility of Rei-chan completely failing!" Haru: "Oh, isn't this the first time we've gone to Rei's place?" Nagisa: "I live nearby, so I've dropped by a few times." Nagisa: "Hey, Rei-chan, why don't you try entering the breaststroke?" Rei: "Never mind entering. I still can't swim any stroke but the butterfly!" Nagisa: "What? Don't say that! You're not the same Rei-chan you used to be. I bet at this point, you could swim any stroke you wanted!" Nagisa: "Don't quit the swim club!" Nagisa: "You can't hide it from us. You plan to go back to the track team, don't you? I don't want that!" Rei: "I don't understand how things are at your house. But I do want all four of us to swim together." Rei: "In that respect, I feel the same as you. Or are your feelings something you could give up on so easily?" Rei: "I believe that you're a person who never gives up. Because, despite all the times I refused you, you stubbornly kept after me until I joined the swim club." Nagisa: "Rei-chan... [crying] I don't... I don't want to give up, either! I want to stay in the swim club, and I want to decide all kinds of things for myself!" Rei: "Then we'll all go now, together, to talk to your parents. We'll come up with a logical approach." 2x13: The Eternal Summer of Beginnings! Rei: "But since then, you've truly worked hard to manage both the club and your studies." Nagisa: "You're more amazing than me, Rei-chan. You went from sinking like an anchor to being able to swim butterfly! Even when your goggles slipped off, you still swam the best you could." Rei: "That wasn't beautiful at all!" Rei and Nagisa were the first characters I made in my Sims 4 game. They lived together in their small house first as roomates and then as a couple. After they got married they moved into a house with a pool and adopted a cat they named Iwatobi. When I got the Seasons expansion pack, Rei and Nagisa were the first characters I played in it and they had a very sweet and memorable first Christmas together.